Jon, explaining what not to do in his workshops. There are many reasons you might know Jon Schwabish. He's an economist at the CBO whose graphs have been shown in Congress, a freelance trainer in data visualization and presentation techniques, the creator of HelpMeViz.com, and one of the organizers of the DC Dataviz Meetups. He tweets and blogs regularly, his guest posts have been featured on VisualisingData.com, AllAnalytics.com and The Why Axis, his infographics have been picked by the staff at Visual.ly, his work is also on Visualising.org and Slideshare. He'll attend Visualized in New York this week, speak at Tapestry at the end of the month and give a class in executive education at Georgetown University this summer. Forgive me if I missed anything. That makes him what? The Ezra Klein of data visualization? In any case, he's one person you need to know if you're in the field and he's a personable chap, so let's hear what he has to say. How did you become interested in data visualization? My formal training is in economics and, until I became really interested in data visualization, I never thought too carefully or strategically about the best way to present results visually. But a few years ago, I attended Edward Tufte’s one-day course. Although I had heard about him in my undergraduate days, I hadn’t seen his books or lectures. At the time, I was working on a CBO report about possible ways to change Social Security. We had 30 or so options in the report, and the main table included a slew of information for each: outlays (spending), revenues (taxes), the balance between the two, the balance over 75 years, and a few other things. Together, the initial presentation was a big, complex mass—a giant spreadsheet, essentially. When I heard Tufte talk about sparklines, it struck me that I could incorporate that simple visualization technique. All I had to do was replace some of the numbers with a “spark-area chart” to give the reader an immediate visual impression of the impact of each policy over time. From there, I started investigating the field of data visualization and found this incredible community of designers, artists, writers, programmers, statisticians, journalists, and all sorts of thinkers and practitioners trying to figure out better ways to present data and information. I was immediately intrigued by two facets of the field: First, I discovered that improving the visual display of information is not entirely subjective—for example, there are lots of people examining how our brains perceive and understand information and how best to present it. And second, I found an outlet for my creative side, which, as an economist, I hadn’t really been able to tap into. So I took a 10-week class on the Adobe Creative Suite and started combining my economics research and new design skills to create infographics and other types of visualizations. What is the role of data visualization in your job as an economist for the CBO? Is this something that other government employees could emulate? At its core, data visualization is about communication and CBO’s mission is to communicate relatively complicated concepts about the federal budget and the national economy to members of Congress and their staffs. Data visualization is a very important and effective tool for helping those efforts. In addition to my research on immigration, food stamps, Disability Insurance, and inequality, for example, I also help colleagues at CBO with data visualization—both on the data analytics side and on the presentation side. On the analytics side, I try to help people find tools that help them better understand their data or their models: mapping tools like TileMill or StatPlanet and interactive tools like Tableau; or other kinds of tools, like R and Excel. On the presentation side, I try to help colleagues create more effective visualizations and, in some cases, create other graphic products—like infographics and Snapshots—to accompany longer reports. More recently, I’ve become more interested in improving the ways economists and analysts more generally present their work orally. In that vein, I try to serve as a resource for colleagues at my agency—and analysts at other agencies and policy organizations—who want to think about their presentations. I think it’s easy for a government employee with a quantitative background to emulate my approach. Being able to work with data and to understand the challenges that the data and analysis present is the first—and, arguably, the most important—step. From there, it’s about carefully and strategically considering how to effectively communicate information. That is, even if the scatterplot I use to explore my data ultimately ends up in my paper, I have to think about the font, color, and annotation I use to present it to my audience because my job as a writer or presenter is to convey an argument or information, not simply to hope that the audience will somehow follow the story. Through your data visualization workshops, you've worked with multiple government agencies. What opportunities do you see for government to use data visualization? Where does the resistance come from, if any? A senior economist once told me that he didn’t need to worry about “selling” his research, so creating more effective visualizations isn’t worth his time. That sentiment typifies much of the resistance—it’s that line of thinking that considers it the responsibility of the reader or the audience to somehow “figure out” the important results. But that view is misguided, I believe—making research accessible and more comprehensible is what will ultimately lead to better understanding of the complex issues that researchers are attempting to communicate. All the same, in my experience, the vast majority of government analysts want to present information efficiently and effectively—even if they are not sure how to get started. The main impediment is that lots of analysts think they don’t have enough background in design to be creative with their data and to present information more effectively. But you don’t need a degree in graphic design to create effective basic charts. Three short steps—getting away from default colors and layouts, integrating text and graphics, and reducing clutter—can generate major improvements. The next level—creating more complicated graphs or infographics or slidedecks or interactive visualizations—may require more training in design, layout, and storytelling. But those are skills, as I’ve demonstrated in my own career, that can be acquired and honed. You started HelpMeViz.com as a platform to “facilitate discussion, debate, and collaboration from the data visualization community,” Are you happy with the first few weeks? How would you like to see it evolve a couple years from now? The first few weeks have been terrific! People from all kinds of fields are excited about the site and the discussions and relationships it might encourage. I’ve heard from economists, health analysts, medical doctors, research assistants, people in communications and marketing—as well as programmers—all looking for advice on how to improve their work. At this point, the site has more than 10 visualizations seeking help and the number of submissions continues to grow. My hope, of course, is that as more material shows up on the site and more people comment and offer suggestions and advice, even more people will send in their work. I do want to emphasize one important aspect of HelpMeViz: It is designed for anyone to submit or comment. The purpose of the site is not to simply give experts in design or data visualization or programming languages the opportunity to provide feedback and advice. Instead, it is designed to encourage all types of analysts, designers, writers—whomever—the opportunity to lend their thoughts and their expertise to challenges they or others face. Right now, I’d like to see more discussion among the visitors to HelpMeViz. I also would love to get people to send in finished products and say, “This is what I made, but now I’m curious to see what others might have done.” I’d also like to see whether I can get some coding or programming challenges on the site. I’m not exactly sure how that would work—HelpMeViz is not meant to be a Github knock-off—but I think it would be an interesting challenge to get to work. In the long-term, I can envision a variety of directions for HelpMeViz: badges for contributions, forking paths for different suggested solutions, remake contests, sponsorships, and tutorials from contributors. Success will be determined by the community and whether people see it as a constructive place to receive feedback and help rather than a negative place to criticize and bring down people’s work. Asking for critical feedback isn’t easy for anybody, but if the site can maintain the positive, constructive focus it has had so far, I’m excited about the prospects for success. With all these side projects and your job, what's in your future as a data visualization expert? Ah, the great “where do you see yourself in 5 years” question. You know, I’m not exactly sure. Right now, I am enjoying combining my economic research interests in important policy areas with my interest in figuring out better ways to communicate that information to more and more people. There are still great strides to be made in figuring out better ways to communicate complex analyses and making those results meaningful for people. I would like to continue my data visualization workshops and extend my teaching to formal settings: I have some workshops coming up, but I am also scheduled to teach a two-day executive education course at Georgetown University this summer. I’m working on plans for a possible data visualization course at the University of Maryland-College Park next fall. UPDATE: On April 21, 2014, Jon announced that he will soon be leaving the Congressional Budget Office to move to the Urban Institute. He promised to update his answer to the last question — stay tuned. If you want to keep up with Jon, Twitter is a good place to start. 1. How did you become interested in data visualization? Career-wise, my jobs have always been in analytics - first in banking and more recently at Google. I tend to migrate towards roles that sit at the intersection of the highly technical statistical stuff and business. My educational background is in mathematics and business, so I feel like I can talk to both sides (given that they don’t always speak the same language!) and help them to better communicate with each other. I love being able to take the science of data and use it to inform better business decisions. One key I’ve found over time to being able to do this well is the ability to communicate effectively visually with data. I initially recognized the value of being able to do this well in my first job out of school - I was working as an analyst in credit risk management (before the subprime crisis and before anyone really knew what credit risk management was). My job was to build and assess statistical models to forecast delinquency and loss. This meant taking complicated stuff and ultimately turning it into a simple communication of whether we had adequate money in the reserves for expected losses, in what scenarios we would be at risk, and so forth. When it came to the communication piece, I saw it as my opportunity to play a little and be creative. I learned quickly that spending time on the aesthetic piece (something my colleagues didn’t typically do) meant my work got more attention by my boss and my boss’s boss. For me, that was the beginning of seeing value in spending time on the visual communication of data. The big turning point for me came at Google. We were buidling out an internal training program and I was asked to develop content on data visualization. This gave me the opportunity to research data visualization and start to understand the principles behind effective data visualization - helping me understand why some of the things I’d learned through trial and error over the years had been effective. With this research, I developed a course that I taught at Google for a number of years. I love this space. I enjoy the challenge that comes with presenting complex stuff in a clear and straightforward manner. And I’ve found that I also really enjoy teaching others how to be better at this. As part of my work in this space, I also write a blog that can be found at www.storytellingwithdata.com. 2. You worked at Google for six years. Could you describe your role there and how Google uses data visualization internally? Sure, I can talk about this at a high level. At Google, I worked on the People Analytics team. This is an analytics team that’s embedded in Google’s HR function, My focus was to promote better decision making with data and create innovative analytics in areas like employee engagement, manager assessment and development, organizational planning, and attrition management. I won’t speak broadly about how Google uses data visualization, but on our team we used it to help communicate the findings of our research and analytics. When you need to convince someone to do something differently or take some sort of action, showing the evidence in the data can be a really effective way to do so. 3. Can you tell us why you recently left Google and share some details about your plans? Leaving Google was a difficult decision. It really is a magical place to work and I honestly can’t imagine working for another company (it would be hard to measure up!). But I’ve been growing my own business over the past couple of years and am very excited to take that to the next level. I mentioned that I developed and taught a course at Google focused on data visualization. 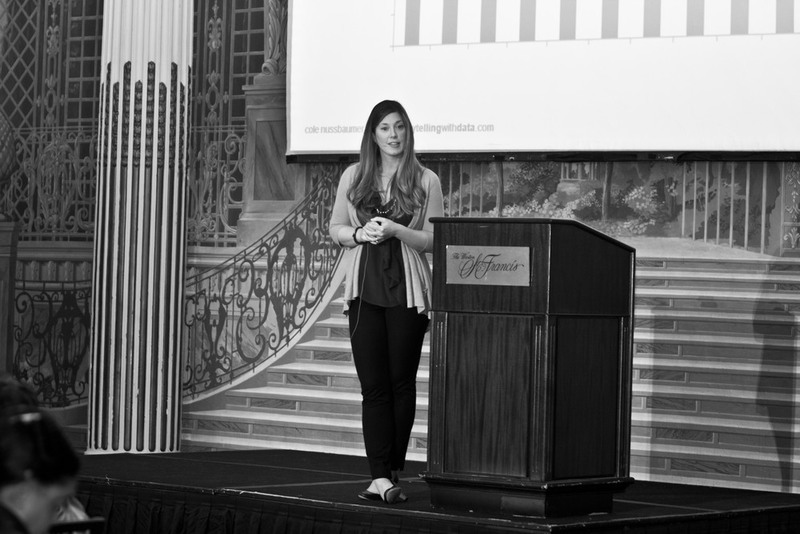 At one point, I thought - why stop there - and created content that I have used externally for the past couple of years, speaking at conferences and conducting workshops for organizations on how to communicate effectively with data, or what I’ve come to call “storytelling with data”. I’ve found that as awareness of what I’m doing in this space increases, so does the demand for it, so earlier this year I decided to leave Google to pursue my goal of teaching the world how to tell stories with data. Currently, this mostly takes the form of workshops that I conduct within organizations (more details are on my website under Custom Workshops). Recently, I also offered my first public session in Washington DC, where individuals could register and attend a half-day workshop (Francis, thanks again for attending!). I plan to do more of these in other cities (I’m nearly ready to open up registration for upcoming sessions in San Francisco and also plan to do one in Chicago in the fall; details are on my site under Public Workshops). I’m still at the early phase of figuring out what this looks like over the long term, but in the meantime I’m having a lot of fun teaching, expanding my network, and continuing to learn in this space. If you’re interested in keeping up with what I’m doing, follow my blog or on Twitter @storywithdata. 4. You’ve visited many organizations by now: any insights on what they have in common and what differentiates their data visualization needs and skills? From what I’ve seen, every organization faces a similar challenge: they may recognize the need to be able to communicate effectively with data, but people skilled in data visualization are hard to come by. Part of the challenge is that data visualization is a single step in the analytical process. Those hired into analytical roles typically have quantitative backgrounds that suit them for the other steps (finding the data, pulling it together, analyzing it, building models), but not necessarily any formal training in design to help them when it comes to the communication of the analysis. It’s only very recently that I’ve started to see university and continued learning programs offered in the area of data visualization; in general, people aren’t taught how to do this well and so we rely on our tools to understand best practices, and our tools can lead us in some bad directions (meaningless color, 3D that adds clutter without informative value). In my opinion, every organization has opportunity for greater impact through upskilling their analysts in this area. The organizations that do well here are the ones who recognize the value that a well-designed visual communication can have, invest in talent (and training!) in this space, and reward those who do it well. 5. Given that many of your students must have done some data visualization before taking your class, what preconceptions or ideas do they have that you find hardest to change? There’s a desire to demonstrate the effort that went into the work product. When you do an analysis or build a model, often times you end up turning over many rocks to find the one or two interesting gems. There’s a desire to want to show the many rocks you turned over when you communicate your findings, because that took a lot of time and is sort of evidence of the robustness of your efforts. But this means the audience also has to sort through all of these rocks to get to the one or two important things. In your communication, you should really only focus on the one or two important things to ensure your point gets across. No data dumps. There’s a belief that the audience should draw their own conclusion. I often hear people say they want to show data and let the audience draw their own conclusion. For me, this is a dangerous space that should be avoided (the exception would be when you really do just want to put data out there for an audience to explore, but I would argue the need for this is rare). If you are at the point where you want to communicate something, you are in the best position to frame the context and story for your audience. Sometimes there is hesitancy to do this and people have the belief that their audience knows better, but I think that is incorrect. What I teach is that you should lead with the story and then the data becomes supporting evidence of this story. Even if you end up focusing on the wrong thing, it starts a better conversation than a data dump ever will. Bottom line lesson: any data you show should be part of a story. Francis, thank you for the interview. It was great to get the opportunity to meet you in DC a few weeks ago! If your readers are interested in learning more about me and my work, please encourage them to check out my blog at www.storytellingwithdata.com. Thanks very much! It's been a busy year for Alberto Cairo. In January, he started teaching information graphics and visualization at the School of Communication of the University of Miami; in August he published The Functional Art; and, from October to December, he gave his first massive open online course (MOOC) as a teacher. Having been a student in his MOOC, I was curious to hear his views on this format and data visualization, and to know more about his background. He kindly agreed to do an interview and, with his usual generosity, took the time to share his thoughts at length. In your review of this first MOOC as a teacher, you describe the format as workshop more than college-level course. Is this how you imagine this new format will evolve? Where do you think it will be some 10 years from now? It is difficult to say. I am not good at making forecasts. Who is, anyway? Forecasts are probabilistic, so I am going to tell you what my hunch is about what may happen in the near future —not 10 years from now, that's too far. First, I don't think that MOOCs will replace all regular college courses anytime soon, at least in their current format. There's a lot of hype about MOOCs and, as much as I like the idea behind this model, I can also see its shortcomings. My lab classes, for instance, in which I go very deeply into how to design infographics and visualizations, cannot be taught online completely, since a good portion of them is based on one-on-one interactions with students, on creating personal, mentoring relationships with them. Students work in the lab, I sit with each of them, we talk about their works in progress in front of their computers, etc. (More about this in my next answer). Nevertheless, I do foresee that MOOCs will (and should) kill the 50 (or 100! )-people lecture-based 101 class. That model didn't make sense fifteen years ago, when I was in college, and it is a waste of time and resources today, when you have tools that let you offer those kinds of things more efficiently. More theoretical and introductory courses will inevitably be taught online, as they are cheaper in terms of instructor time, and because doing so improves learning: Not all students are really awake at 9 a.m.; some of them would prefer to do their homework at night. They can do their readings, watch short video lectures, or do their homework when they want and where they want. And certain courses may not even be taught by professors of the institution the student belongs to. Why would I design my own Biology 101 for-credit MOOC when the accredited college next door has a better instructor and has already spent the money to develop the materials? Online education opens the door for a lot of partnering opportunities. It allows you to avoid duplication not only within your institution, but across the entire institutional ecosystem. It may also put mediocre instructors in danger or, even better, it may force them to improve. Besides, an online environment allows all students to ask tons of questions (in forums) and engage in long discussions with peers, something that is not really possible during the one or two hours of a regular class session. I don't really get that many questions from students when I lecture in the classroom, but when I teach online, students come up with useful comments and insights all the time, as they don't feel the pressure of the time constraint, and they may do it when their cognitive skills are in good shape —after a good cup of coffee, or while ingesting a tasty dinner. Finally, and against what many old school instructors think, it is possible to have synchronous conversations with students in an online course, if you need to. In the same review, you explain that you took on the teaching of this MOOC as a first step towards some long-term goals. Is this something you can share with us? The short answer is that I don't want to face another cliff in my career. The long answer is that there are certain institutions that I love and that I want to not only survive, but also thrive. Reckless and constant experimentation is essential for that. I am a journalist. I used to work in newspapers, which are usually considered essential for a healthy democracy. Still, they are in dire straits. Why? Because most citizens don't think like me or my colleagues. They don't care. They get their information online and, in spite of what most journalists think, that information is not mostly crappy and gossipy. In many cases, it is much better than what they used to get in newspapers. Just to give you an example: I read a lot of science news, and I don't get them mostly from the media anymore, but from blogs written by scientists. This is called "disintermediation"; it is a form of disruption. This little anecdote shows that wishful thinking can be really dangerous: Certain institutions with long roots, such as news organizations, know that they are essential for their societies; but being essential doesn't guarantee survival in the long term. We humans tend to mistake necessary conditions (offering high-quality products or meaningful experiences, among them) with sufficient ones (which are usually unknown). What I saw happening in newspapers is awfully similar to what I am seeing in higher education: Drowsy institutions with inflexible procedures and obscure lore that are resistant to change just because they feel solidly rooted, stable, and essential. Why would you experiment when your current situation is so comfortable and your model has taken you a long way, up to the present? Because if you don't seriously —let me stress the word seriously here— try to understand what all new developments, technologies, tools, are capable of, when one of them becomes the next big thing, you may suffer. It is not about burning your ships here; you need to keep using them in routine operations, after all. Instead, it is about taking a few of them and sending them to the open ocean to see if they find something useful. Most of them will be lost, but it may happen that one will stumble upon a treasure island. So the answer to your question is that my long term goal is to learn as much as possible about how technology reshapes education, and try to give this knowledge to institutions I work for and care about. The only efficient way to do that is by testing, failing, and trying again. So I am trying MOOCs with the idea of bringing that model (or at least, borrowing parts of it) to the University of Miami; I have acquired experience in for-credit online education at the Universitat Oberta de Catalunya —a public school in Spain— for the past seven years; finally I am starting to do some experiments with hybrid classes at the University of Miami. There's nothing original in this last idea. It has already happened in basic education (my 7 year-old kid does many activities online), so why wouldn't colleges go deeper into this model? My courses, which deal with design, infographics, and data visualization, have theory, discussion/critique, and practical components. What I am trying to do is to automate whatever can be automated. That means that if I have to teach how to use a specific piece of software, I don't explain it all in the classroom. I record a long video workshop about the basics and, after students watch it and work on it at home, I use class time to answer questions or explain advanced techniques, run discussions, critique projects, or work on exercises. Same for some lectures. Hybrid models allow you to stop being a teacher and become a true mentor, as I mentioned before. They free time and resources that you can use more efficiently. This is where I believe the value of traditional colleges is, and will be: Not in being lectured by a top-notch instructor, but in being able to sit with her or him on a regular basis and have meaningful intellectual cross-pollination. After two MOOCs as a student, this was your first as a teacher. What surprised you most from this new perspective? This will be short: What has surprised me the most is how generous people can be with their time. MOOCs allow you to perceive what's good in human nature, our innate drive to share with others. Your biography goes back to 2000 when you were at El Mundo. Can you tell us more about how you became a visual journalist? Was this part of a plan or something you stumbled upon? Since I was a kid, I have been a voracious reader and a visual person. When I was in college, I wanted to do radio, but I was offered an internship at a local newspaper, La Voz de Galicia, to do infographics. They knew I was able to draw a bit, and I was also a journalism student, so I had an uncommon mix of skills. I didn't know much about infographics at that time, but I learned from some of the best. They inspired me. I haven't stopped doing graphs, maps, and diagrams ever since. On data visualization: based on your experience as a practitioner and your role as a teacher, what would you say has been the biggest change in the last ten years and what do you expect it to be in the next ten? The biggest change I'd say is that graphics and visualizations have gone mainstream. Due to inexpensive technologies and an increasing awareness of what you can achieve with them, they are everywhere: in science, in journalism, in business, in education... This is a trend that I believe will only grow stronger, as what technology is doing is taking advantage of our visual nature.